These super-easy, melt in your mouth Mexican wedding cookies made with lots of almond meal and rolled in powdered sugar are a global favorite! Almost every culture has a variation and all are delicious! What are Mexican wedding cookies called? 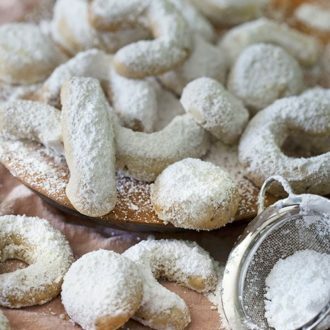 Mexican wedding cookies (Polvorones) are shortbread-like treats called kourabiedes in Greece, snowball cookies in parts of America and the list goes on! So delicious and they whip up in a snap. The cookies themselves are not very sugary so that heavy dusting of powdered sugar and just the right amount of sweetness. What is the Origin of Mexican Wedding Cookies? These cookies have been around forever in various permutations with many different names. The name Mexican Wedding Cookie came about in the 50’s from U.S. cookbooks. In Mexico the cookies are actually known as polvorones. You can sub in ground walnuts if desired. They’re less easy to come by if you don’t have a nut grinder but so delicious! Try toasting the almond meal just a bit before using. it will definitely add some depth of flavor, just don’t forget to let it cool first! Make sure to roll in powdered sugar as soon as the cookies come out of the oven, they need to be hot for the sugar to stick. Rotate cookie sheet half way through baking to get a more even color on the cookies. How do you make Mexican wedding cookies? Preheat to 375 degrees. Sift almond meal into a medium bowl and set aside. Cream the butter in a stand mixer. Pour in vanilla and salt. Add powdered sugar, mixing until fluffy. Add almond meal, then add flour in increments. Mix until incorporated. 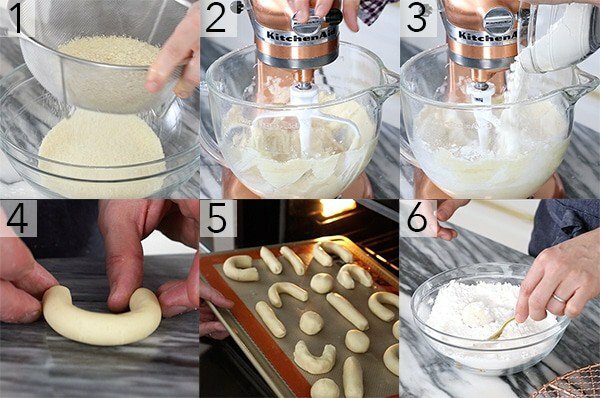 Form dough into crescent, rod, or ball shapes. Bake for about 10 -12 minutes or until cookies are a very light golden brown. Let cool slightly. Roll cookies in powdered sugar while warm. Transfer to a cooling rack and sift a bit more on if desired. How Long do Mexican Wedding Cookies Keep? These cookies are best within a day or so of baking but they last for around a month if stored in an airtight container. A delicious melt in your mouth cookie made with lots of almond meal and rolled in powdered sugar. Preheat to 375 degrees. Sift almond meal into a medium bowl. Add powdered sugar in increments. Mix until fluffy. Add in almond meal, then add the flour gradually until incorporated into a dough. 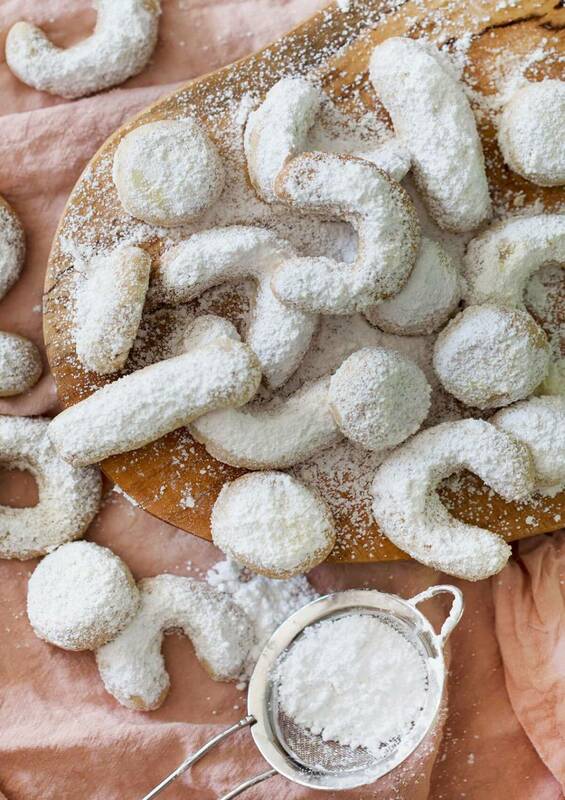 Sift confectioners sugar over cookies. You can also roll them to cover for a sweeter, more powdery texture. You can sub in ground walnuts if desired. They're less easy to come by if you don't have a nut grinder but so delicious! Try toasting the almond meal just a bit before using. it will definitely add some depth of flavor, just don't forget to let it cool first! 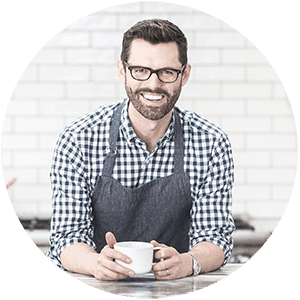 Almond meal and almond flour are different, but I’m sure you can find both at Publix! Hope you enjoy! Is almond meal finely ground almonds? These look amazing. I want to give this recipe a try. Yes, almond meal is finely ground almonds! I’m sure you can pick up a bag of almond meal at your local market! I grew up eating Mexican Wedding cookies! These are divine! Any suggestion on substituting almond meal ? You could substitute the almond meal for another nut meal, but it’s important for the texture of the cookie! Hope you enjoy! I am not much of a baker but your recipes are the bomb. Want to make this recipe but would like to know if I can prepare the dough today, store it in the fridge and bake them tomorrow?